I've been tagged by Anthraxxxx again! But thank you because I finally have a chance to show my cute (when I was a kid) and ugly (now) photos here. I don't have much choices of photos as most of them are in my hometown. So I'll try to use whatever is available. I'm HCFoo and it's my real name, my initial. 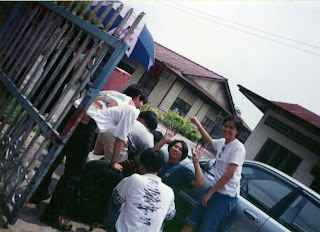 I was born in Kuantan and spent all my young and teenage years inside the shell. I'm the eldest in my family but I'm also the naughtiest. I grew up among kaki mahjong because my so-called god grandmother (who was also my mum's boss until she took over the hair salon business) organized daily gatherings and games behind the shop. Despite all the distraction and helping my mum washing clients' hair (all women) at the salon, I did find time to study. So, I managed to get through Form 6 with flying colours and got into a local university of my choice. However, I did not enjoy studying because I regretted choosing the course. I chose the course based on my result and its popularity and not my interest. 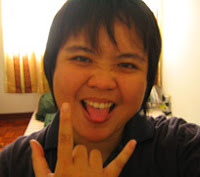 I spent most of my time partying in KL and PJ and discovering the magic of the cyberspace. I would say that the best moment I had in the university was getting to know my housemates. Perakians are really nice and friendly. I've been in the educational publishing line for many years now. Although I've tried other industry (including chemical and logistic), education and publishing remain dear to my heart. I hope to further pursue my studies so that I can serve the country one day. It's always my ambition and passion to lecture in a local university. But hey, I'm not a nerd or a bookworm. I don't have much interest. I enjoy non-fiction books, blogging, tennis, history, jazz, concerts and live music, reality shows and documentaries. Well, as for other personal stuff, it's better remain unsaid. Now, I'm going to tag anyone in my blogroll who are interested to reveal themselves. Anyone? 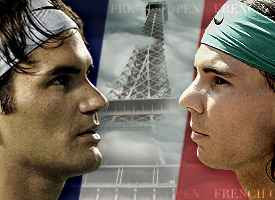 Woahoo~ another final match between Rafael Nadal and Roger Federer. Watch it on Astro SuperSport this Sunday at 9 p.m. Since the first day of the French Open, I've been joining the the prediction contest on the Roland Garros official website. Starting at over 8000th place, I've improved to 4542 rank today. Oh yeah, there's another contest that I joined today. I'm sure some of you guys like to watch Miami Ink on Discovery Travel and Living. I'm a huge fan of the show. If you want to go to Miami and get a tattoo from the tattoo artists in Miami Ink, go to the contest website and tell them what tattoo you want to have and why. Seldom yam char with friends because on diet. No gathering means no topics to discuss about. Don't really watch television. So don't really know what's going on television. Not much outing because no free passes, concerts or events going on recently. Only tennis is on my mind. Can't blog too much tennis though or else I will bored everyone to death. Don't really read The Star these days. So nothing to discuss about. Spending too much time on writing manuscripts after work. So I'm exhausted by the end of the day to blog. I enjoy reading blogs and writing comments more than updating mine. Nah, this weekend was rather amazing. I have life indeed. I attended an amazing party on Friday and it was my first party in two years. But no details about the party I attended because not so appropriate as some of my students read my blog. What would they think of their tutor later. And I managed to catch Miss Universe 2007 on Star World channel 70. Miss Philippines (not Miss Kangkang, mind you) whom I blogged about recently won herself Miss Photogenic. Congrats! Miss Japan is not bad but I think Miss Korea is more beautiful. But I guess saying that you love children and enjoy teaching will win you the crown. However, for me the most outstanding contestant should be given to Miss USA. Despite a slip while doing the evening gown session and being booed by the Mexicans (for political reasons), she remained calm and graceful. While watching Miss Universe, I saw the promo of The Ellen Degeneres Show. Finally we get to see the talk show on local television network. It will be shown on Star World channel 70 on Monday at 8 p.m. starting this week.